Day 6 – Probably not a recipe you were expecting, but your best friend will love it! I’ve been attempting to plan out at least a few days in advance as to what I’ll be baking each particular day. The other day as I was in the bathroom I had a visitor. It was not the first time I have had company in that small space and I’m sure it won’t be the last. If you’re a mother or if you have any pets, you know what I’m talking about. We no longer have toddlers, they’re teenagers and I know if they caught me in the bathroom they’d be… how shall we say it? Yeah, mortified and probably need years of therapy. And my visitor was neither my husband or the family cat who has also been an uninvited guest. The one who joined me was our 6½ year old Golden Retriever named, Brady. Remember we are from Rhode Island, and are avid Red Sox and Patriots fans, so when we purchased our first family dog in August of ’04 he had to have a New England connection. As you dog lovers know, there is nothing like the unconditional love from your dog. I never had one growing up, but my husband did. I had resisted owning one when the kids were little because that was the last thing I felt we needed to add to the mix; three kids under the age of five was a lot for me. So, with those big brown eyes looking up at me, I decided that Brady should have something baked for him during this challenge, too. I have to say that the kids were disappointed they wouldn’t be taste testing anything today. I offered them the treats, but they declined. Before I became a stay-at-home mom in May I worked at a veterinary clinic for two years as the office manager. At Christmastime one of my co-workers, Diane Isha, generously brought in some treats for our own personal dogs. When I brought them home and gave one to Brady, he devoured it and absolutely LOVED them. Diane has so wonderfully agreed to share her recipe with all of you and I know if you make them, your best friend will be very happy. They are made with one of their favorites, peanut butter, not with who-knows-what they put in the store bought stuff. :-/ They were very easy to make and inexpensive. 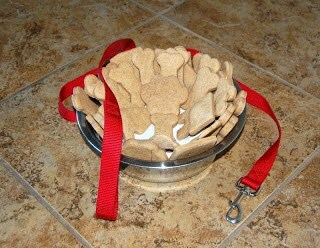 I didn’t have any bone shaped cookie cutters, so I did buy some and found them at Michael’s after thinking Petco would be the place. As you now know, I hate to pay full price for anything and was very excited to be able to use my 40% off coupon that was in this week’s Michael’s add. Score! Preheat oven to 350°. Combine oil, peanut butter and water. Add flour 1 cup at a time then knead into firm dough. 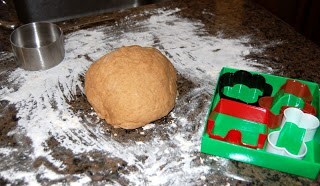 Roll dough to 1/4 inch thickness and cut with small bone shaped cookie cutter. Bake at 350° for 20 minutes. Makes 2½ dozen. I made 36 cookies from the dough, but I used different shapes. Brady sat in the kitchen as if he knew that today was his special day. He scarfed the two that I gave him and was so excited he almost took off my finger even after I told him, “gentle” which he does. 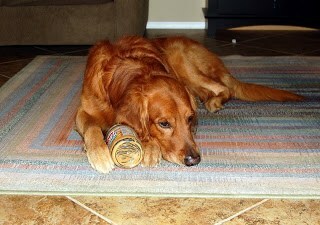 The house smelled like peanut butter, too! Now I’m off to watch “Chopped”. Tuesday night at 8 is the one hour during the week I demand the remote. I love that show! If you haven’t seen it, check it out, it’s on the Food Network. Four chefs compete for $10,000 each week. They are each given a basket with secret ingredients that they need to use to prepare an appetizer, entree and desert. With each course the basket changes and it’s so neat to see the food they create with the ingredients they’re given. I think I have the rest of the family addicted to it, too. Lynne, I hadn’t seen this post but am so glad I stumbled on it. 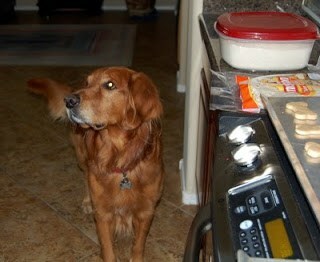 So we both love to bake, have picky teenage sons AND adorable Goldens? 🙂 LOVE THIS PICTURE! Nice of you to make him biscuits. I am fairly certain we should be friends.